Mr. Hong Kong winners and their routes to stardom. Female artistes who get placed in the Miss Hong Kong Pageant often become heavily promoted by TVB. Its male counterpart, Mr. Hong Kong, is less prestigious. In its first year of launch in 2005, Mr. Hong Kong generated great interest, but was subsequently suspended from 2012 to 2015, and well as 2017. The most successful winner to emerge from Mr. Hong Kong is unquestionably Benjamin Yuen (袁偉豪), compared to Matthew Ko (高鈞賢), William Chak (翟威廉) and Jack Hui (許家傑). Heavily promoted by TVB in recent years, Benjamin even won the “My Favorite Actor” award in the Malaysia/ Singapore regions at the 2018 TVB Anniversary Gala for his role in Stealing Seconds <棟仁的時光>. The 37-year-old started out as a model and starred in commercials ten years before he won the Mr. Hong Kong title in 2007. Benjamin gradually rose from supporting to leading roles, and became a favorite casting choice among TVB producers due to the recent exodus of big stars at TVB. Matthew Ko was the very first Mr. Hong Kong pageant winner in 2005. The now 34-year-old has starred in TVB dramas such as To Grow With Love<肥田囍事>，and even played second male lead in 2009’s Man in Charge <幕後大老爺>. His TVB roles after that were largely unmemorable. Sensing that he received less and less work, Matthew later joined his friend’s car workshop and spared no effort in helping out with big and small tasks from repairs to greeting guests. Four years ago, Matthew went to Mainland China in the hopes of reviving his acting career, starring in two productions per year, including the latest remake of Justice Pao <包青天>, in which he got noticed for his role as the classic character “Zhan Zhao”. Still keen on the Hong Kong market, Matthew has been working on a story with Mainland scriptwriters recently and is set to return to Hong Kong to work on the film collaboration, if all goes well. 2010 winner William Chak impressed judges so much that he was awarded with seven secondary accolades beside the main pageant title, including “Most Charming Mr. Hong Kong” and “Tourism Ambassador” awards. The actor had also clinched runner-up earlier in 2005 at the Mr. Asia Contest held by Asia Television (ATV). The 33-year-old, who went to Japan for overseas studies when he was 18 and has a black belt in Taekwondo at Korea’s Yonsei University, is fluent in both Japanese and Korean. His linguistic abilities also made him the go-to host for mostly travel programs including The Sun Still Rises <廉遊韓國> and Travel in Shokuju <滾動四國>. In dramas, William did not receive many chances to shine, often playing minor sideline characters or as a guest star. His most memorable role to-date was the handsome Dr. Lee in Come Home Love: Dinner at 8 <愛·回家之八時入席>, which was a hit with netizens, though he appeared only in three episodes. Regarding his seeming lack of career chances, William has mentioned in an interview, “I (feel that) I am not too bad, though not the best…I hope for a good role in which I can shine,” The multi-talented actor also plays the guitar and basketball. 2009 winner Jack Hui’s name might not be familiar, but he makes a popular couple with Mandy Lam (林淑敏) in Come Home Love: Lo and Behold <愛．回家之開心速遞>. Known for his gorgeous dimples and muscular physique, the 35-year-old was an auditor before he joined the entertainment industry. His pairing with Mandy was so well-received by fans that the actor became one of the most popular searches on search engines this year. His claim to fame however was not purely a matter of luck. Though Jack’s character was originally scheduled to appear in just a single episode of the long-running sitcom, he trained up for perfect biceps by lifting five-gallon water containers fifty times. The overwhelmingly positive viewer response led to producers giving him a full-fledged character in the series. With an appearance in Fist Fight <兄弟> as well, Jack is finally reaping the rewards of his diligence. TVB left out one detail about Benjamin. Beside modeling and acting in commercial, he’s also a film actor. I remember seeing him in ‘Young & Dangerous’ prequel. 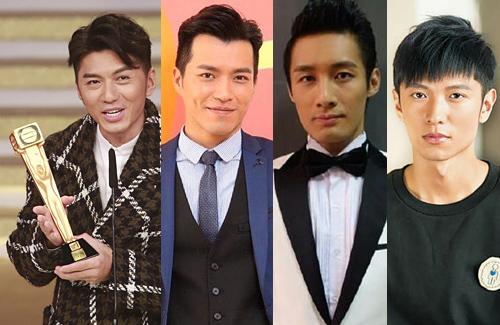 TVB upcoming male actors have potential, the ladies need to step up.